Wiseband gives you the keys to create an effective Spotify profile and access to your statistics. Spotify is the largest streaming platform in the world with 50 million subscribers, it’s important to create an effective artist profile to allow your fans to follow you. In addition Spotify has a powerful tool to access a lot of statistics about your songs. We will help you create a relevant profile and then discover the Spotify For Artists tool to analyze your statistics. If you don’t have a Spotify account click here. It is not possible to directly modify your biography, Spotify relies on Rovi to retrieve data. You can apply here. You can sync Songkick to your Spotify account to see your concerts on your artist profile Spotify. With Spotify For Artists you can access a large number of statistics. We will introduce you to the main ones. 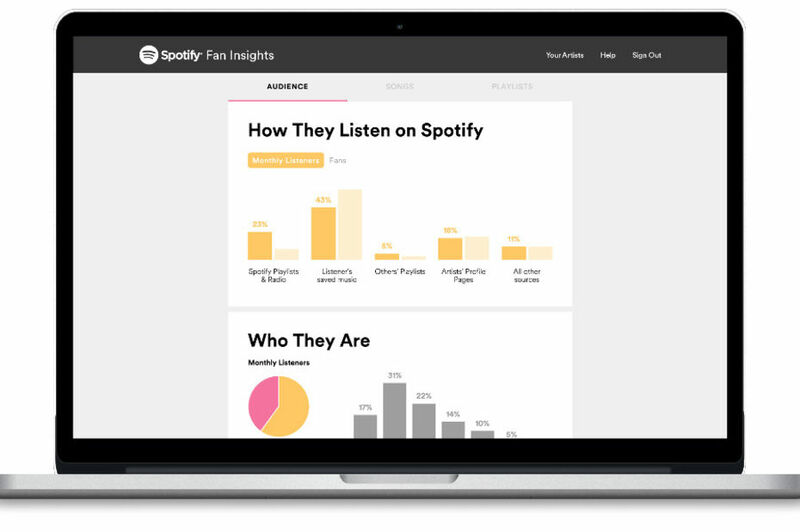 With their Spotify tool, you can see the number of listeners per month and the number of people listening to you live. It is possible to see by country where your titles are listened to. More precise than listening by country, that by city. This data seems very relevant to us, since it allows us to see the number of people listening to you by city. This is a useful tool to plan your tours and concerts or convince a place to make you play. Spotify offers many other tools that we invite you to discover. Merlin, the organization who fight for our rights with labels & independent distributors at world scale has started negotiations with spotify about the revaluation of royalties. Spotify sales reports for February and March 2017 are not available until the end of the negotiations. However, we will receive them by the end of May. We will distribute them on the day of their receptions. For the second year in a row, the association Hellfest Production sets up a springboard for its Fan Club : « The Voice Of Hell II ». Here, it’s not Sundance Head or Kevin Simm, but the future of Metal Music. The 1500 members of the Hellfest Cult will choose the winner of the contest, who will play on the private Kult scene. The winner will play on the Kult’s private stage, really interesting when you know that the Hellfest 2016 attracted more than 160.000 spectators over 3 days. Before, they will perform in “Le Ferrailleur” (Nantes – May 21st) for the latest date of the Warm Up Ride 2K17 tour. You want to participate ? Go on this page: https://www.thevoiceofhell.fr/HFT2/#/newBand until April 2. What happened for the finalists ? Acod recently announced their signature under Sony. Kause 4 Konflikt joined HateSphere‘s European tour last November. Qobuz, created in 2008, is a French platform offering a download, streaming and musical information offer. The platform defines itself as multi-specialist. Propose a vast and sharp catalog (in terms of references and metadatas) in all musical genres, classic, rap, jazz, rock… But also in categories as children’s music, theme music, background music and audiobooks. Qobuz also stands out and above by the quality of sound proposed to his users. Indeed, the platform allows the fans to reach a quality of reception upper or equal to the CD. Qobuz is the first in the world which offer the Hi-Res 24-Bit streaming to his subscribers. Qobuz sublime. Fans can also buy their favorites albums HD (96000kHz/24bits). Wiseband delivers the NoMadMusic catalog in Hi-Res for almost 3 years. Classic, jazz and world music label is for the honor during a month on the platform. Discover the whole catalog at special price until March 13th, 2017! More than 50 references from NoMadMusic to discover ! If too, you wish to distribute your catalog in HD, you have to get back at first your masters in the following formats: 96000kHz / 24bits. This option is reserved for the Artist account PRO or PREMIUM account. If you fill these 2 criteria, you can create a new article from Products page > Catalog of your account Wiseband and upload your album HD. Once the ended upload, thank you for notifying it to us by sending an e-mail in contact@wiseband.com – OBJECT: distribution HD on QOBUZ.